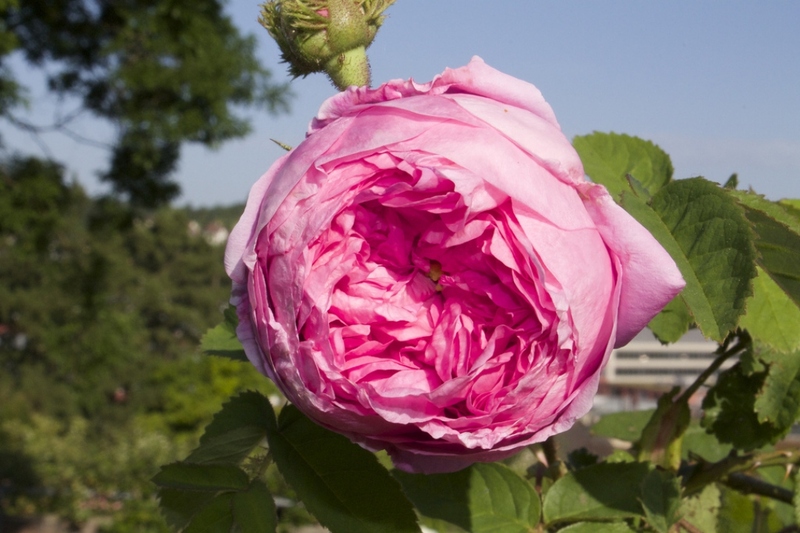 Provence rose (Rosa centifolia): growing, planting, caring. A group of once-flowering rather large roses. Centifolia roses are derived from Rosa × centifolia, a hybrid that appeared in the 17th century in the Netherlands, related to damask roses. They are named for their "one hundred" petals, due to the globular shape of the flowers, and are often called "cabbage" roses for the same reason. The centifolias are all once-flowering. As a class, they are notable for their inclination to produce mutations of various sizes and forms, including moss roses and some of the first miniature roses. Popular cultivars include 'Centifolia' and 'Paul Ricault'. Roses are woody plants with a creeping, bushy, shrublike, or climbing habits. Stems are often thorny, creeping, climbing, or erect, with alternating leaves, 3 to 20 cm long, and carrying 5 to 7 often serrated leaflets. Fragrant flowering, from summer to autumn, of very different shapes, colors, and size. The fruit, called rosehip, is red or orange, oval or rounded. If your rose only flowers once in July, it is called "once blooming". If it flowers again after the month of June, it is called "repeat blooming". The planting is done ideally from September to March, in frost-free conditions, especially with bare roots. In this case, a good drench (put mud on the roots) will make a huge difference. Plant in soil that is fertile, cool, well drained, humus rich, and not too chalky in direct sunlight (what do you mean that's asking for the moon?). Prune damaged roots and shorten branches to 25 cm. Plant without burying the root collar, tamp down well around the roots, and water generously when planted. Form a little planting basin if you plant late for watering during the first year. Timeless advice from Groww: fertilize as a preventative measure in November. Be reasonable, roses just need a little organic fertilizer (manure, compost, etc), 100g/m² is enough. Nothing is stopping you from testing out a few of your own little recipes (banana peels for minerals, coffee grounds against aphids), but Groww provides no guarantee! Avoid mulching with fresh wood during the blooming period. First and foremost, find a calm spot for you to sit as this article might be a little long. If you have any rare roses, it could be worth taking a class with a specialist who will explain the gestures and the subtleties of pruning the most sensitive of roses. Note that roses don't "need" to be pruned, you do it to maximize their flowering. Here, Groww will explain the ABCs of pruning for the most common cases: -We will differentiate between repeat blooming roses, who reflower several times after the month of June, and once blooming roses who only flower one time. You will prune the repeat bloomers in February-March, and the once bloomers from July to September after the flowering. -To avoid black stumps under the cuts, always cut just above a bud (an "eye" in gardener language) without leaving several centimeters of wood to rot. Work with pruners or a branch cutter, always keeping the counter blade on top so as to only crush the falling branch. Regularly disinfect your blade to prevent transferring diseases. -Maintenance pruning for shrub, climbing, and bush roses consists of removing the stems that are too vigorous (sprouting under the bud union), dead and damaged wood, and the overly weak stems. Then, try to clear out the center of your rose so that light reaches everywhere. A rose must have between 3 and 7 stems that sprout from the base, thus select the strongest branches and don't hesitate to cut an old branch from time to time. This selection completed, shorten the lateral branches to 3 or 5 bud eyes (count the buds starting from the base). For large vigorous roses, you can prune at 7 bud eyes. - Also prune repeat blooming climbing roses in February-March so as to have 5 to 7 wooden branches from which you will count 5 to 6 bud eyes for shortening the side branches. - Prune once blooming climbing roses after the end of their flowering by also keeping 5 to 7 main wooden branches, but shortening the side branches to two bud eyes. - Small roses, with a bushy or creeping habit, don't have to be pruned as rigorously. Shorten the lateral branches which bother you and clear out the center by cutting dead wood and vigorous stems from time to time. And there you go, happy pruning! Water abundantly but not too frequently, so that the roots will fetch water deeper. Water thoroughly until the soil is wet and a small puddle forms around the tree. Roses hate competition, so either you love to hoe, and you hoe every two weeks, or you mulch twice a year in order to have 3-4 cm of straw or wood on the ground. Mulch with what you have with a reasonable quantity: a little (very very little) bit of grass cuttings, dry leaves, or even compost, not yet thoroughly decomposed before winter. The importance is to cover. Pay particularly close attention to damage to the bark or the wood. The numerous attacks that your roses are subjected to when it comes to their leaves (black spots, insects, aphids) are less dangerous to their health.